The Handmade Gift Guide is featuring Sunday Afternoon Housewife (among several other fantastic artists such as SHAbangDesigns and JBirdsGarden) in the Handmade Gift Gallery now through February 1st. If you stumbled on to my blog because you clicked the link at the Handmade Gift Guide, then welcome! Please take a moment to look around and read a bit about Sunday Afternoon Housewife. If you’re simply looking to purchase the cutie pie owl pendant featured in the Gift Guide, then head on over to my Etsy Valentine’s Day Shop and pick it up. All scrabble tile pendants in my Etsy Shop are on sale. 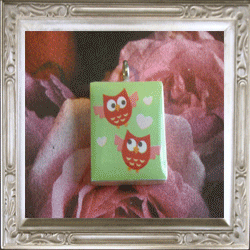 If you buy any 2 scrabble tile pendants, then you get to pick one out for FREE! As an added bonus, anyone who subscribes to my blog through February 1st will get FREE SHIPPING from my Etsy Shop! I really hope you like what you read here and what you see on my Etsy. I hope you’ll come back here often. There’s a lot of fun brewing throughout the posts of this blog and much, much more to come.